You work hard on your safety & health/EHS program at work. You give it a lot of thought, you spend a lot of time on it, and you care a lot about it (and about the people and environment it’s intended to protect). But how do you know if what you’re doing is effective? How do you know if it’s working? How can you measure your own performance? One thing you can do is to keep track of the number of incidents at work. Things like work-related fatalities, injuries, or illnesses. Or chemical spills to the environment. As a group, these are known as lagging indicators. They’re called lagging because they tell you about things that have already happened. 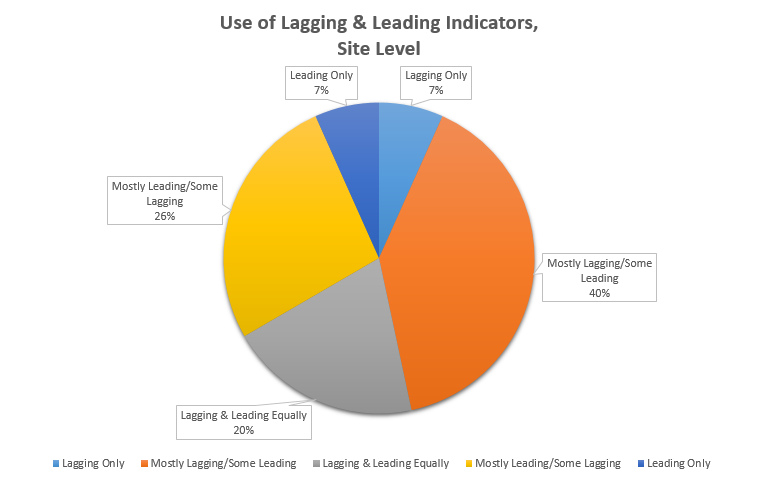 Lagging indicators have their place, and they’re important to track. But they have their limits, too, and it’s helpful to track other stuff as well in order to truly measure the success of your EHS program. But jokes aside, what are leading indicators, in general? What are some good examples? What’s the point of using them? How can you get started using them? Those are the kind of questions we’re going to address below. 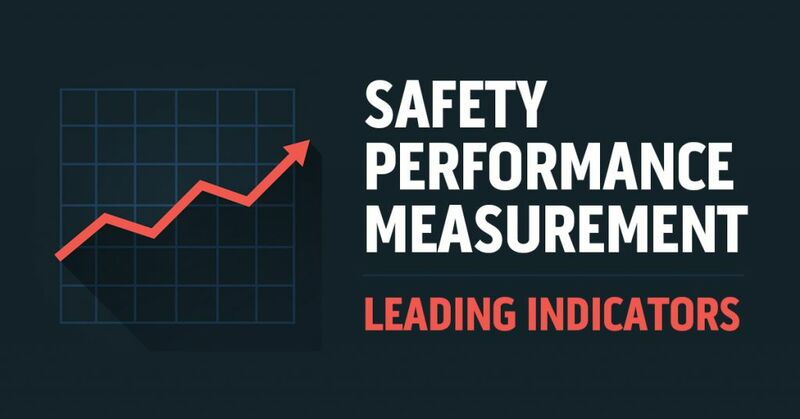 If this article is of interest to you, once you’ve read all we have to say about leading indicators for safety, you may also find some articles we have on Safety Differently and HOP (Human and Organizational Performance) interesting as well. Check out the links at the bottom of this article for more on Safety Differently & HOP. Convergence Training are safety and safety training experts. Click the links below to learn more about how we can help you. What Is a Leading Indicator? A leading indicator is something that gives you an idea if something else will or might happen in the future. A leading indicator is not a guarantee that something will happen in the future. But as the name implies, they indicate or suggest an increased chance that the future event may occur. For example, you commonly hear leading indicators discussed when people are talking about the national economy on the news. These economic leading indicators give us a way to anticipate or predict what the national economy as a whole might do in the future. And maybe even a chance to take action and change the odds (and the future). Some examples of economic leading indicators include manufacturing activity, retail sales, building permits, the housing market, and new business start ups. You can see how analyzing these leading indicators can help you predict if the national economy will grow, slow, or even contract in the future. And that’s one of the primary benefits of leading indicators–they help you anticipate and predict. And another benefit is that they let you take action and make changes that might affect the future. For example, if leading economic indicators are slowing, suggesting that the national economy may go into recession, the government may choose to react by increasing government spending or reducing taxes, with the goal being to avoid that recession. What Is a Safety Leading Indicator? Now that we know what a leading indicator is in general, let’s turn our attention to what a leading indicator is in terms of safety or EHS. 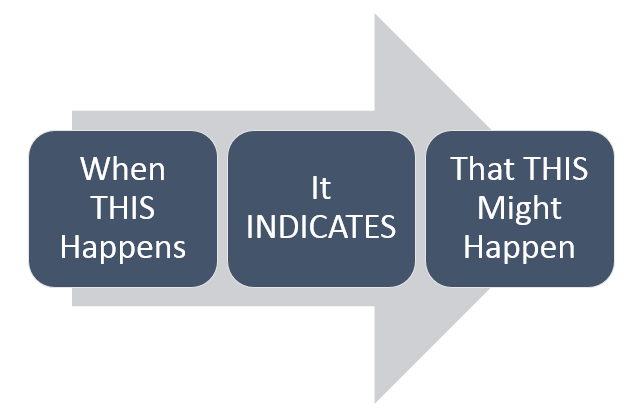 So at the most fundamental level, a safety leading indicator is a predictive tool you can use to identify and then eliminate or control risks that might otherwise lead to incidents and injuries. Note that the two key aspects are the predictive capability and the ability to use the information to act and then change the odds. What Are Some Characteristics of Good Leading Indicators? That definition above gave you some good insight into what a safety leading indicator is, but let’s look at this more closely. There are many things you can measure at work. We call these metrics. Some of these metrics are things you can choose to use as safety leading indicators. We’ve already said that the metrics you choose to use as leading indicators should have a predictive power that helps you eliminate or control risks and thereby reduce incidents. When you select the measures you want to use for your own safety leading indicators, keep these tests in mind. If you’ve selected a metric to act as a leading indicator that you’ll measure, it should stand up to the tests above. If leading experts in the field told you it was important to track safety leading indicators, would that be enough for you to do it? 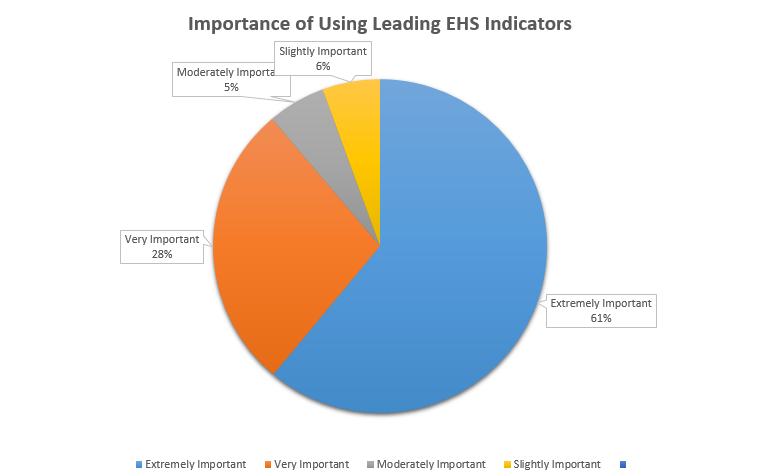 Sixty-one percent of the companies surveyed said the use of EHS leading indicators was “extremely important” and another twenty-eight percent said “very important.” That’s an impressive combined total of eighty-nine percent who give a LOT of importance to the use of EHS leading indicators. Admission-I’m not really sure what it means to be “slightly important,” but I guess it means it’s still important. Apparently “not at all important” was an option and nobody selected that. But maybe you’re not the kind to do something just because experts say it’s a good thing to do. Maybe you need some reasons and some convincing. Well, that’s a good thing, and we’ve got some reasons for you below. The primary reason to use safety leading indicators is because they give you a chance to prevent a problem before it happens. That seems like reason enough. What’s not to like about doing something that will help you prevent a problem? So all told, the use of safety leading indicators is recommended for the reasons listed below. In addition, remember that the schools of thought involving Safety Differently and HOP place a similar emphasis on doing things that work that positively impact your organization’s capacity for safety, which is very closely related to this idea. Check the links at the bottom of this article for more on Safety Differently and HOP. There are lots of different metrics that can be used as leading indicators for safety and/or EHS. There’s no single approved master list of EHS leading indicators that every company uses or that would work well for every company. Instead, each company should select metrics that work best as leading indicators for their own needs and circumstances. To help you come up with your own list, you can think of EHS leading indicators as falling into one of three categories. 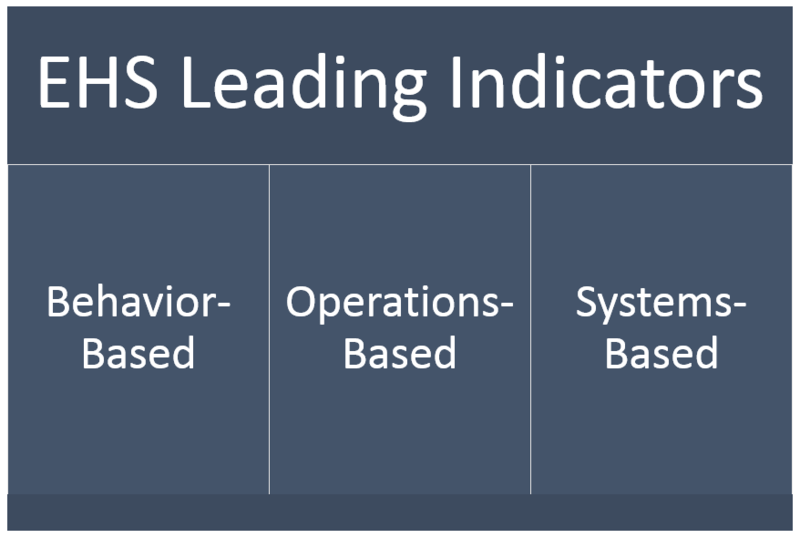 These include behavior-based, operations-based, and systems-based indicators, as shown below. Behavior-based safety indicators are related to the actions of individuals or of groups of people. Examples might include safety walk-arounds by EHS personnel, on-the-job safety observations by employees, and the ratio of positive to negative safety observations, or even the number of learning team activities (from HOP) that you perform. Operations-based safety indicators are related to the function of a company’s machinery, equipment, operations, and infrastructure. Examples might include the number of new training sessions for operators, the number of regulatory inspections without findings, or the number of defects found in equipment. When coming up with your own EHS leading indicators, it may help you to start by thinking of these three categories and make sure you select some indicators to measure performance in each category. 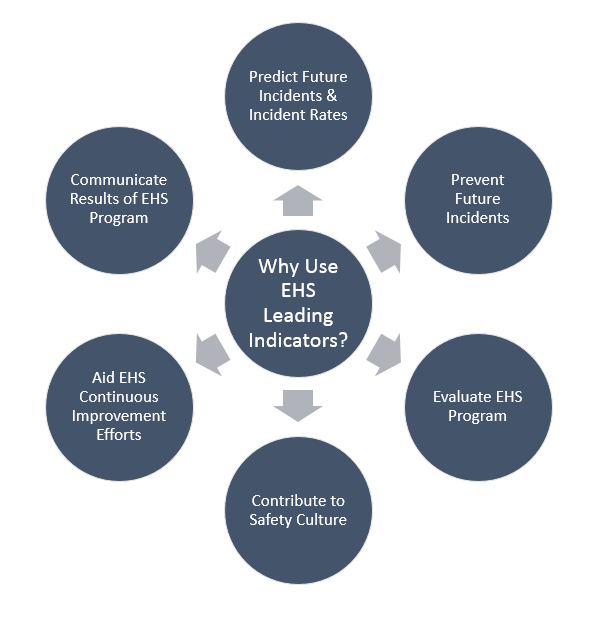 Can You Give Me More Examples of Safety/EHS Leading Indicators? On the other hand, if the list above is enough to get you started or pointed in the right direction, great. Near misses are an interesting issue within the discussion of lagging and leading indicators for EHS. Interesting and controversial, that is. Because there are people in (at least) two camps about whether or not they’re leading indicators and/or whether or not they should be used that way. The report of a near miss, followed up by corrective action, may help prevent a “real” incident from occurring in the short- or long-term future. As a result, some believe near misses are an effective EHS leading indicator that might be useful to measure. An increase in reported near misses may mean there are more hazards in a workplace. But on the other hand, it might just be that people are being more observant, or that they feel more free to report near misses (without negative personal consequences–like being blamed by their boss). Or maybe they feel reporting a near miss is more likely to lead to a positive corrective action. 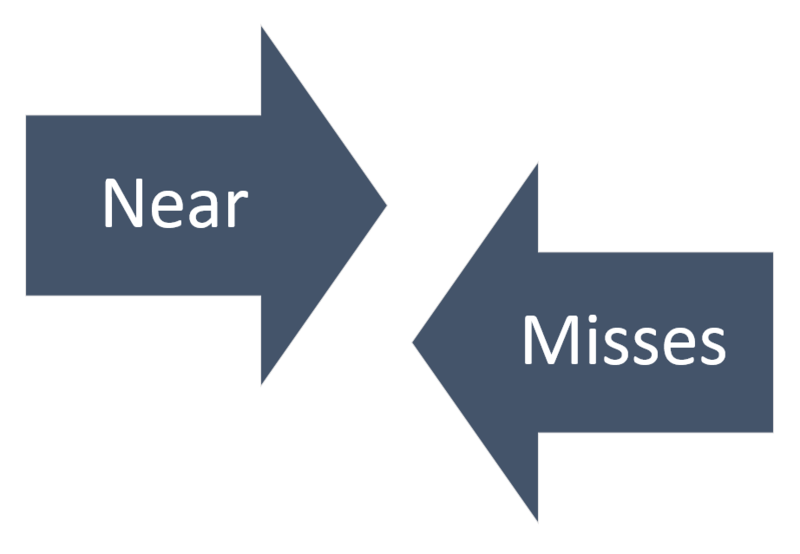 Because the reasons behind near miss reporting can get murky like this, some suggest that near misses are not an effective EHS leading indicator and they recommend against using near misses that way. This seems reasonable to me, but of course you can make your own decision. One final interesting thing about near misses: although we just discussed if they should be considered leading or lagging indicators, there’s another controversy about the name itself. Many people call these near misses, but others prefer to use near hits for this same idea. Check this article and poll for more on that. We’re focusing on leading indicators in this article. So much so, you might get the idea that there’s no reason to track lagging indicators. But that’s not our intention. Let’s turn our attention to lagging indicators briefly. Traditionally, some companies have focused solely or too much on lagging indicators such as injuries and illnesses. And there are some problems with that. For one thing, at many companies, the injury and incident rates (these are lagging indicators) are already quite low. It’s difficult to get them down further, so tracking just lagging indicators doesn’t give much information about the performance of the EHS program. Secondly, if you’ve got a low incident rate and even a minor incident or a small number of incidents do occur, the changed rate may make the EHS performance look much worse than it really is. Additionally, focusing solely on lagging indicators can create give people an incentive to “game” the system. If you’re sole focus is on lagging indicators, and people’s future employment, promotions, raises, and performance bonuses are at stake, what happens when there’s a recordable incident? Isn’t there the possibility that people won’t actually record it? You bet there is. Later addition (after having written the article years earlier): Another issue here that touches on this is the point that Safety Differently/Safety II/New Safety/HOP folks make about the definition of safety. They argue that traditionally, safety has been defined as the absence of incidents (kind of how darkness is the absence of light, black is the absence of color, and cold is the absence of heat). They are that defining safety by what it IS NOT (incidents) is counter-intuitive and counter-productive, and instead say safety should be defined more as something like “increasing the organization’s capacity for safety.” Leading indicators are more in line with that revised, more positive definition of safety, and lagging indicators are more in line with that definition of safety as an “absence.” Read more on this issue of the positive (not negative) definition of safety here. So those are a few of the issues of tracking only lagging indicators or giving too much emphasis to them. But we don’t want you to throw out the baby with the bathwater. Just because you should increase your focus on leading indicators doesn’t mean you should quit measuring lagging indicators. The best practice is to track some lagging and some leading indicators. That’s not how it works at all sites and organizations, as you’ll soon see. But it’s a good practice. The “blend” of lagging and leading indicators that you use at your company will be up to your company. Likewise, it will be up to your company if you use the same blend at the site level that you use at the corporate level, if each site has the same or different measures, and how (or if) you “roll up” the indicators at the department/site/region or district/corporate level. Remember that a safety leading indicator is supposed to have predictive powers. 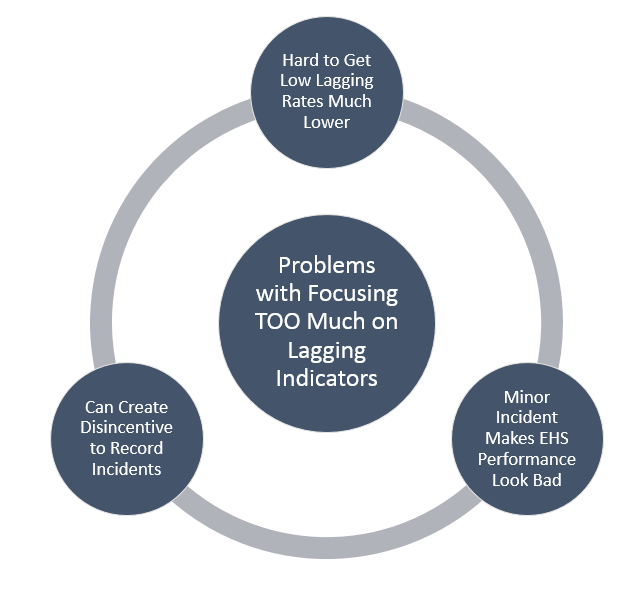 Meaning, if you’re tracking EHS leading indicators, you should be able to use your data to accurately predict what your EHS lagging indicators will do. So, if your EHS leading indicators are trending in a positive direction, then your lagging indicators should also trend in a positive direction. 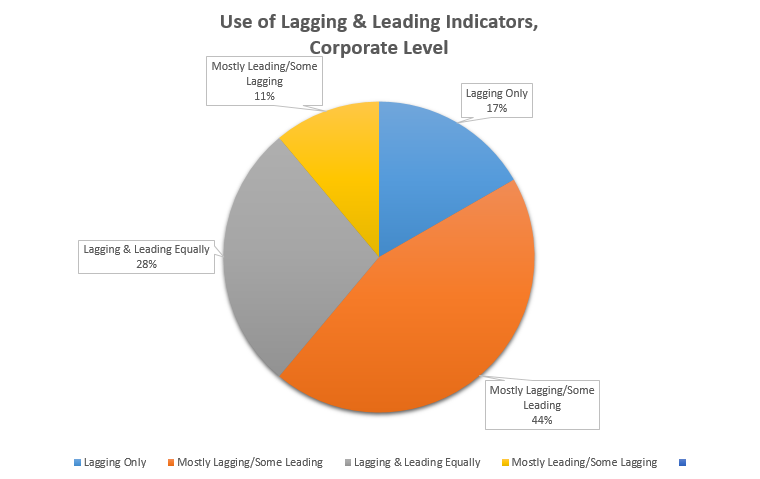 This ability to be able to “link” or connect the performance of your leading indicators with your lagging indicators is important. “The vast majority of respondents stated that having the ability to tie changes in leading indicators to stronger or weaker performance on injury rates and other lagging indicators is very important (64%) or extremely important (21%). The NSC/Campbell Institute document titled Practical Guide to Leading Indicators: Metrics, Case Studies & Strategies includes several case studies that show organizations like Cummins, Honeywell, NASA, USG, and Fluor doing just that. It’s worth checking out if you’re interested in more details. We’re going to stop here, but there’s still more to be said about leading indicators for EHS performance. Notably, how to begin doing it–which ones to select, and how to manage and refine what you’re doing over time. We also welcome any of your comments in the section below. Especially from people who have experience and (presumably) success doing this. Let us know your thoughts! Until then, thanks for reading. We’ll catch you next time. Let us know if we can help you with safety training management software, safety training online courses, and/or custom safety training materials. 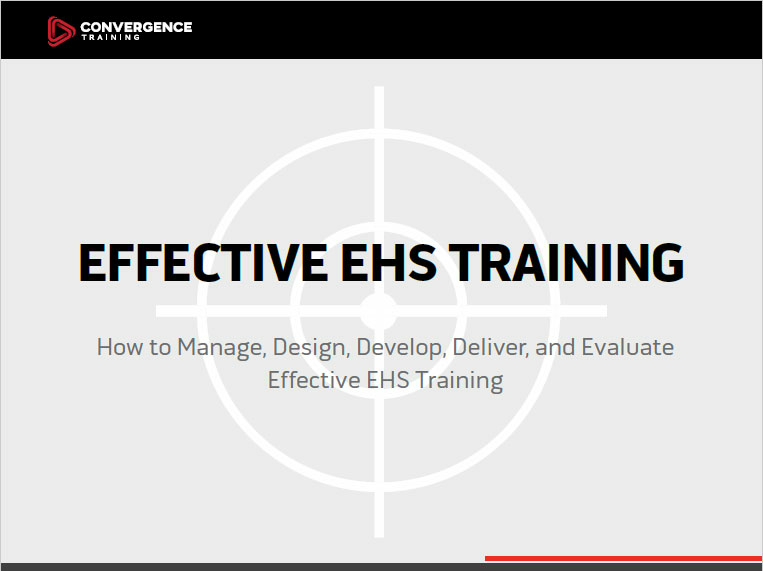 Learn how to design, create, deliver, and evaluate effective EHS training by following these best practices with our free step-by-step guide. This article drew a lot of information from three documents created by the National Safety Council and their Campbell Institute. We think the articles are excellent and we encourage you to download and read them in full (they each average over 20 pages, so it takes a while to get through them and one benefit to our article above is its relative brevity). (1) Transforming EHS Performance Measurement through Leading Indicators, Campbell Institute/NSC, p. 2. (2) Transforming EHS Performance Measurement through Leading Indicators, Campbell Institute/NSC, p. 2. The list in the article above is based on the list presented by the NSC in this document. Their list included actionable, achievable, meaningful, transparent, easy to communicate, valid, useful, and timely. However, their list didn’t explain what these words mean, and I wasn’t sure what exactly they meant by valid and useful (or how those were different and distinct from the other terms). So I made by own, slightly condensed list and created my own definitions). (3) Transforming EHS Performance Measurement through Leading Indicators, Campbell Institute/NSC, p. 8. (4) Practical Guide to Leading Indicators: Metrics, Case Studies & Strategies, Campbell Institute/NSC, p. 4. (6) Practical Guide to Leading Indicators: Metrics, Case Studies & Strategies, Campbell Institute/NSC, pp. 5-7. (7) Practical Guide to Leading Indicators: Metrics, Case Studies & Strategies, Campbell Institute/NSC, pp. 14-18. (8) Elevating EHS Leading Indicators: From Defining to Designing, Campbell Institute/NSC, p. 10. (9) Transforming EHS Performance Measurement through Leading Indicators, Campbell Institute/NSC, p. 10. (10) Transforming EHS Performance Measurement through Leading Indicators, Campbell Institute/NSC, p. 8. (11) Transforming EHS Performance Measurement through Leading Indicators, Campbell Institute/NSC, p. 15. I have just read this article grabbed my attention, I have worked for years developing some cutting edge leading indicators, lagging indicators tell you what has already happened and leading indicators tell you what you can influence!! You have written a very clever article selling an idea of leading indicators that are nothing of the sort!! Your article is full of lagging indicators and guess work, this is pure nonsense!! I’m not following you, however, when you say the article is full of lagging indicators and guess work. It recommends using leading indicators (along with lagging), gives an idea of what leading indicators are, and provides some sources where people can learn more about leading indicators. Maybe you can explain your point further? Pravin, glad you found some useful stuff. Interesting things to consider in your article, thank you for taking the time to write such an article. Tamara, glad you found some stuff of interest there. Have a great day. Good use full information’s and interesting article to read. John, glad you found that helpful. Thanks for the comment. Thank you for the article. I am preparing for a meeting tomorrow and this has assisted me greatly. Great work. Glad to hear this helped. Good luck in your meeting. Cheers.